The book of the project can be seen at Longford library. 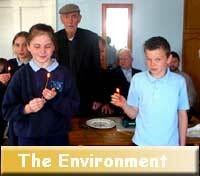 Seventy years ago the Irish Folklore Commission invited children to collect information about their local area. They were encouraged to interview, neighbours and relatives about local traditions under a variety of question headings. The children who wrote those essays are now the senior guardians of tradition in turn. This project. taking place between March and May 07, and facilitated by Chris Thompson, has made use of similar questions to inspire interactive dialogue and ideas for shared learning experiences between Active Age groups and Primary school children around Longford. Together they have entered into a celebration, of stories, crafts and life experiences. 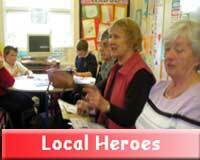 Chapter 1 Local heroes Fascinating adventures and unusual occupations. Chapter 2: Entertainment Sharing ideas for entertainment, old and new. Chapter3: Crafts and skills Churning butter, making rushlights, darning a sock, using old clothes to make a rug: recycling is certainly not a new art. Chapter 4: Our Environment Our environment is changing rapidly. What can we learn about how it used to be? Chapter 5: Local Stories Sharing stories brings them to life. The children act as scribes for their older partners. Chapter 6: Looking to the future. 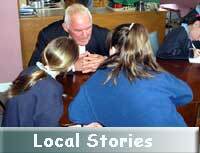 How would we like to see Longford grow into the future? What stories would a another survey collect in 2077? With thanks to everybody who has been involved in the project so far. The teachers and children from the Glen N.S. Teachers and children from Augnacliffe N.S. You can download a few pages from the book for each chapter.